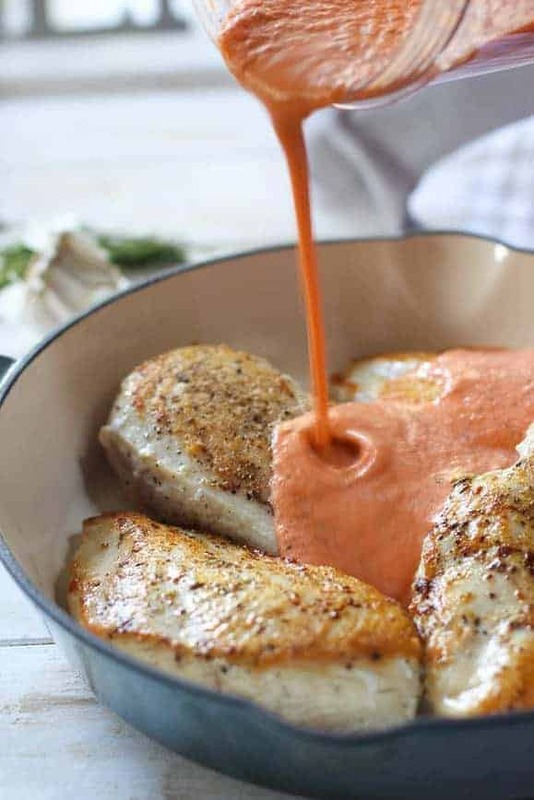 We love this Skillet Chicken with Creamy Roasted Red Pepper Sauce! Simply blend up store bought roasted red peppers along with garlic, chicken stock some spices and a touch of cream. Pour over seared chicken breast and dinner is done! 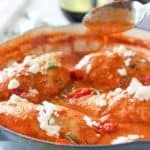 In a world full of food no’s, this Chicken in Creamy Red Pepper Sauce is a big old yes! Store bought roasted red peppers are the base of this lovely dish . This recipe makes a ton of sauce. Don’t you hate making creamy recipes that never have enough sauce? I have that problem with homemade frosting…why is there never enough frosting? Or filling? There is never enough filling….so glad I have a blog to change all that! and love that thing. A food processor will do the job nicely as would an immersion blender. If you have no blender gadgets, you can simply mince the red peppers and have a heartier sauce. 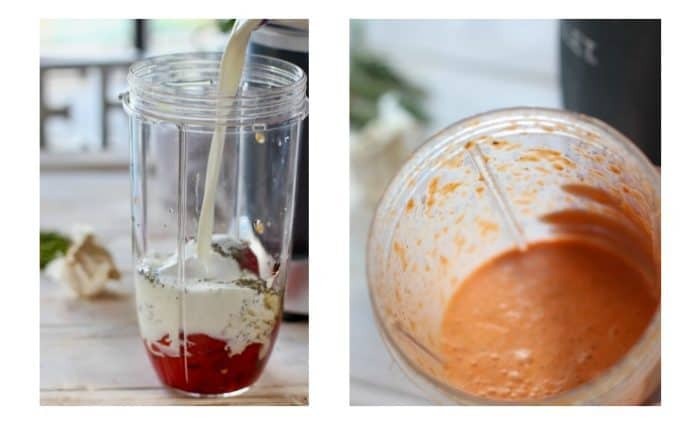 Red Pepper Sauce: Easy to make in your blender! Pour the blended sauce over your seared chicken and simmer! Its that easy! Don’t you love my new pan…I LOVE my new pan! I bought it off of Amazon. You can also see it in our shop HERE! We keep it updated with our favorite things. I have many many plans for this pan. Big Pan Plans! Huuuuuge plans. Pouring sauce over chicken. Delish! Sprinkle with feta, goat cheese or parmesan cheese and serve with pasta if you like. There is plenty of sauce for it! We like our sauces around here and this makes a ton! Top with feta, and garnish with rosemary. SO MUCH YUM. You can use whole chicken breasts, or cutlets. If using cutlets simply reduce the simmer time a bit checking for doneness after 8-9 minutes. This recipe easily doubles or triples to feed a crowd. You can use this sauce for fish as well. Other great recipes that includes roasted red peppers and a shot of cream is our Gnocchi Sausage Soup . Or forget the chicken and just go with pasta! Roasted Red Pepper Fettuccine with Creamy Feta! To Fast, Fresh and Healthy Dinners that don’t taste like it! Mix the sauce in a blender or food processor and pour over seared chicken...so easy, fresh and fast! This will become a family favorite! One skillet, 30 minute meal! Add drained roasted red peppers to blender along with garlic, basil, chicken stock, cream and 1/4 cup feta cheese. Blend for about 30 seconds or until smooth. Add salt, pepper and pinch of chili flakes. Taste for seasoning. Sear chicken until lightly brown - about 3 minutes on each side (will not be fully cooked but will continue to cook in sauce). Pour sauce from blender over seared chicken and simmer for about 20 minutes or until internal temp of chicken reaches 165. (you can see our favorite thermometer HERE). 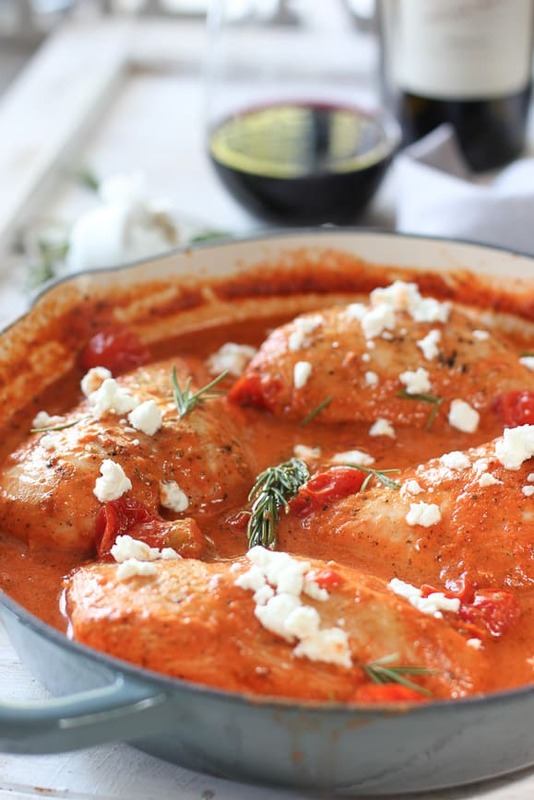 If using cherry tomatoes, toss in about 5 minutes before chicken is done. Top with additional feta, goat cheese or parm! Serve with pasta, bread, salad or fresh steamed broccoli. I just discovered your blog and made this recipe for supper. Oh my, is it good! And so easy to prepare. I used chicken tenderloins and a little homemade pesto that I had on hand instead of the basil and garlic. I served it with red lentil pasta. We loved it and will definitely make again. I am looking forward to trying more of your recipes! Make our day Christina! Thank you so much for taking the time to leave such a nice note! The red pepper sauce is a staple around here. You can cook fish fillets in it too! Look forward to hearing from you again! 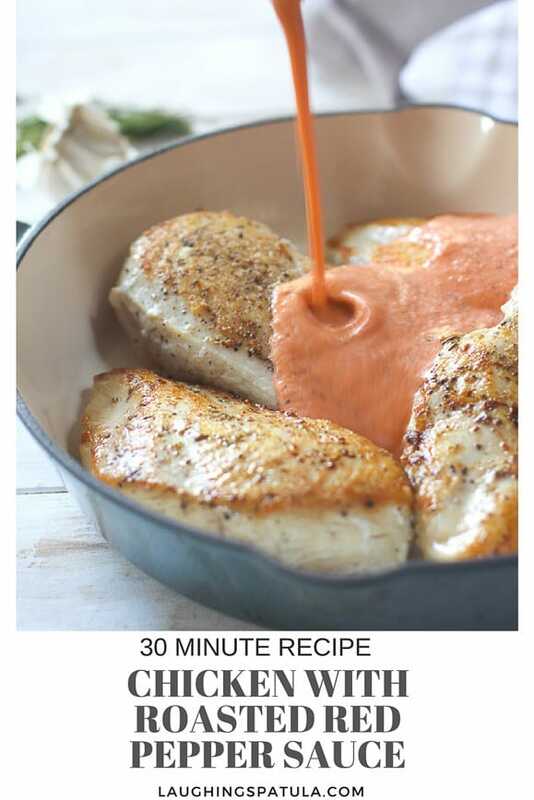 I would like to try this dish, but am thinking of grilling the chicken breasts and serving the sauce on the side – my husband isn’t a huge fan of cooking chicken in sauces. This is delicious and very easy to make! And it made the whole house smell good. I used fresh mozzarella instead of feta, and I added salt and pepper to the sauce to season it up a bit. My whole family cleaned their plates! This one is a keeper. Thank you! I am so glad you liked it! I need to make this again myself! Just letting you know that I included this recipe in my Low-Carb Recipe Love on Fridays post today. I hope a lot of my readers will click over here and try it! Thank you Kalyn! I am a huge fan and thrilled you are including my recipe! 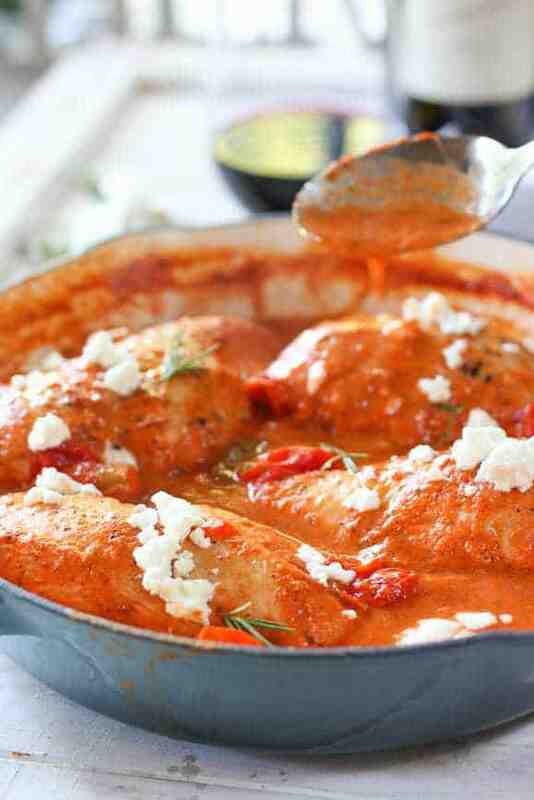 This look soo good and creamy and perfect for dinner tonight! Thanks for sharing! Thanks Sam! ps.. Your blog name is so totally cute! Hoping you get a chance to try it Dana…thanks for your note! Thanks Anne – More sauce the better an this one has a lot! Take care and thanks for the note! I love your flavors and I totally, I mean, totally love dishes where the protein is served in a sauce. Thanks Peter! Hope you get a chance to give it a try! Thanks Ali – hoping you get a chance to give it a try! LOVE those Italian flavours! This sounds creamy and dreamy. I think I’ll try it with goat cheese as you suggested. If you do…let me know how it is! I think I’ll make it that way next time. Thanks for your note!